Then each chief of the visiting tribe danced with his own mask. He danced with his dancing-garment, his carved headdress inlaid with abalone shell and set with sea-lion bristles, the welcome rattle, and the dancing apron set with the bills of the puffin, and with leg ornaments. During the dance each chief caught his supernatural power in the air, went to the chief’s son, holding the power in the palms of his hands, and threw it into the chief’s child or his niece or nephew. Masks were among the most important objects representing a chief’s halaayt (spirit powers). Each portrayed a different guardian spirit in bird, animal, or human form. 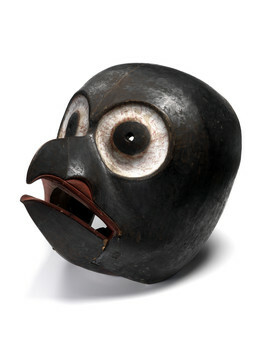 This Nisga’a mask was recorded as the representation of an owl. The beak is designed to open and close.